Would Mitt Romney Be Good For Short-Term Economic Growth? Insofar as I have to guess, I think short-term growth will be faster under Romney than Obama for three reasons. First, in the post-1980 era you get bigger budget deficits with Republicans in the White House than with Democrats and that’s a good thing in the short-term. Second, the Federal Reserve seems to be biased and delivers looser monetary policy with Republicans in the White House. Third, Republicans are much more likely to promote short-term economic growth at the expense of environmental concerns. Maybe! However, I don’t think his second and third items hold water. The Fed does seem to be biased in favor of Republican administrations, but this is mostly in the last year before an election. What’s more, Fed policy is already pretty loose by historical standards; Ben Bernanke doesn’t seem to think very highly of the current Republican Congress; and by 2015 the economy is likely to be in pretty good shape no matter who’s president. On the environmental front, I think you could make the case that weaker regulations might spur growth a bit in the medium term, but not in the short term. Partly this is because it takes a fair amount of time to turn things around even via executive order, and partly it’s because, despite conservative wailing, the Obama EPA really hasn’t done very much that, even arguably, is more than marginally harmful to economic growth. Coal plants are in trouble mostly because of competition from cheap natural gas, not because Obama is killing them off. But that does leave Matt’s first reason, and that one is….surprisingly hard to judge. 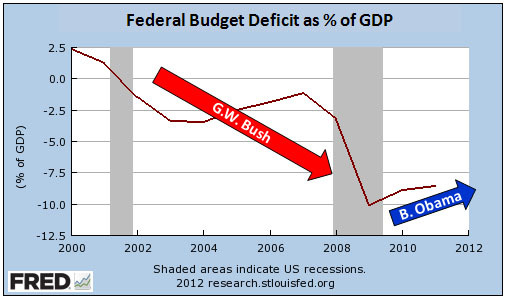 If Romney is elected, the House will immediately vote to restore the Bush tax cuts and possibly cut taxes even further. But can they get enough Democrats in the Senate to peel off and support them? Maybe. Spending is similar. If Obama is president, Republicans will almost certainly be adamant about implementing spending cuts. If Romney is president, they might decide to compromise on some modest cuts and just let it go. Maybe. So it’s no sure thing, but yes: the chances are probably higher of running big deficits under Romney than under Obama. Republicans won’t call it stimulus, they’ll call it tax cuts on the one side and restoring our military to greatness on the other, but tomayto, tomahto. It’s all the same, and it’s probably a bit more likely if Romney is elected. In other words, Republicans will agree to help rescue the economy only if we put their guy in the White House. Capiche?